Trenching and mass rock excavation projects come complete with a unique set of challenges. Each surface has certain qualities that make different cutter drums better equipped to accomplish the task. Some situations call for smaller and more precise attachments, others call for large heavier options. One specific scenario that can be challenging for excavation projects is the cutting and removal of limestone. From a technical definition, limestone is a sedimentary rock that principally consists of calcium carbonate. Due to the many forms limestone can be found in, it is known to vary in hardness. In most of our local applications, the limestone that is found is incredibly hard. The greater hardness levels in these limestone deposits call for heavy duty excavators with large attachments that provide enhanced stability. Another challenge associated with limestone is that it is commonly found in shallow water. This means that you need a drum cutter that is durable enough to handle the hard limestone and is equally efficient underwater. Alpine drum cutters and cutter heads are specifically built to not only handle the difficulties of grinding and cutting, but to also be easily fitted to perform in underwater scenarios. Our fully waterproof systems are guaranteed to perform at highly effective levels in either fresh or saltwater. We are also able to offer some custom solutions if your situation calls for extraordinary equipment applications. Alpine drum cutters are extremely helpful pieces of machinery that make the entire drilling and cutting process easier. Our broad footprint of cutter drums, power, and large number of teeth make them highly effective options. One of the more difficult stages of excavation projects involves scaling. Scaling is the finishing step in a drill or blast project when all loose rock and debris is removed to make the interior of the tunnel or room safe for thoroughfare and further work. This process is a critical step in ensuring a safe work environment. Our smooth, vibration-free machining action effectively completes the job without disturbing the foundation or creating micro-cracks. This results in a smooth wall that is consistent and durable. To have the smoothest scaling possible equip yourself with an Alpine drum cutter. Limestone provides a variety of challenges for excavation projects, but we're happy to help you with everything you need to handle the job. Our drum cutters are used in high-production underground limestone quarries across the United States and are also being operated for scaling in underground storage facilities. 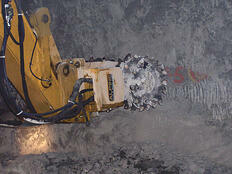 Alpine drum cutters have even been used successfully in the removal of limestone in underwater applications. Our wide variety of drum cutters include heavy attachments that work with large excavators that produce a more stable, less bouncy effect. If your next project involves the removal of limestone, check out ALPINE’s drum cutter selection to find the attachment you need to complete the job. Mass rock excavation projects are tall tasks that present many technical areas of difficulty and call for a certain level of professionalism. Different conditions dictate best practices at construction sites. Depending on how hard the surface is, and what elements are present in the soil, there are a variety of different directions crews can take to achieve the same results. Sometimes the situation makes a more precise tool necessary, while other times there is no choice but to use large, powerful options. The different methods available all have different ramifications that change the way the job is handled. One such consequence that companies must take into account is the amount of loose debris that an excavator creates. This loose debris must be taken care of to ensure that the excavated area is completely safe for thoroughfare and additional work. This finishing step in an excavation project is called scaling and normally follows a drill or blast project that creates a large amount of debris. This article will explore why RockWheels are the ideal solution for scaling after a drill or blast project. 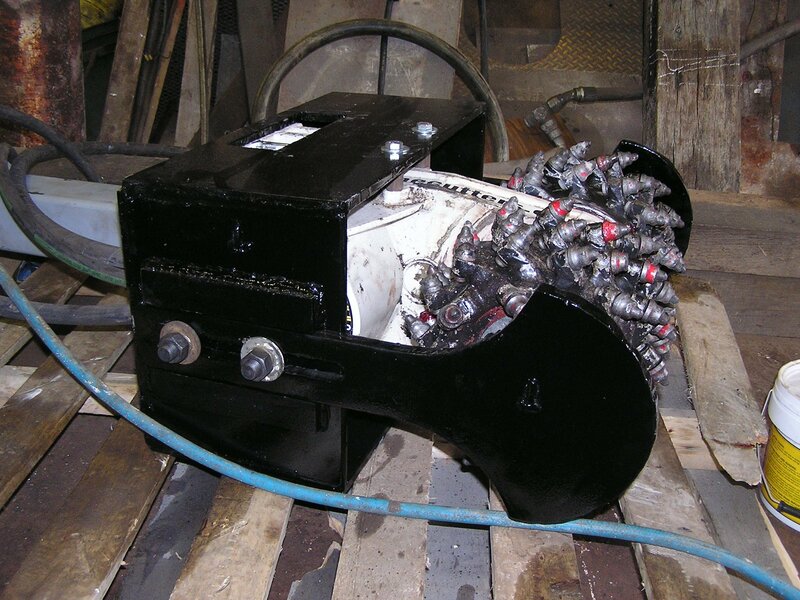 The underground mine scaling-RockWheel has proven its technical superiority to many customers who rely on RockWheel to keep their mine walls safe and stable after drill and blast operations. Safety is a primary concern during these dangerous projects, and the RockWheel has proved itself to create the most stable and safe environment during scaling. One of the biggest assets of a RockWheel is their utility. The Rockwheel has a major advantage over a scaling claw or hammer simply because of the area of the cutterhead that physically interfaces with the rock. Scaling claws and hammers simply do not have the same type of cutting width that RockWheels provide. Rockwheels come in different sizes to best serve the conditions you are operating in on site. Scaling jobs on hard rock like the Limestone we have here in Central Pennsylvania call for the larger and most powerful RockWheels. These powerful RockWheels offer up to 4 feet of cutting width, which will greatly increase the speed of the scaling process compared to the rate of a single scaling claw. Rockwheels are attachments that can be used on standard equipment, such as excavators, and although specialized scaling machines are somewhat common in the industry, they aren’t necessary. We have years of experience outfitting scaling equipment with cutterheads and rockwheels. We can help you finish the job without investing in specialized scaling machines, so the potential to use existing equipment is an advantage. The last reason that a RockWheel is exactly what you need for your scaling needs is its high level of efficiency. The spinning rotary drums with teeth are an ideal system for scaling after drill and blast because the force of the teeth on the rock never exceeds 45o. By limiting the pick interface to 45o and below, loose material is chipped off along fractures created by the blasting. The angular interface of the picks on the wall create very minimal over-breaking. Minimal over-breaking means a clean, stable wall that leaves a scaling job well done. If you are involved in a project that relies upon drilling or blasting, consider a RockWheel and see how it performs in scaling. 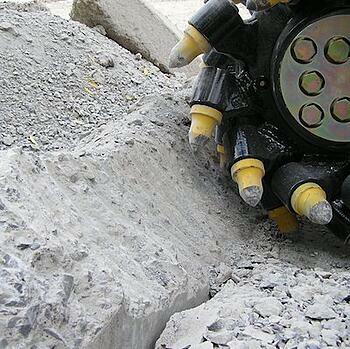 The transverse RockWheel is the ideal tool for concrete scaling and the rehabilitation of concrete structures. The RockWheel delivers impressive results and are more convenient than hydraulic hammers. They are easier to control and afford premium precision when working with sensitive structures. 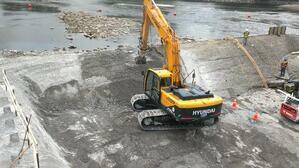 This makes them a great option for projects such as foundations and bridge abutments. Cutterheads operate with low-noise and smoothness that result in stable, consistent walls that are not susceptible to micro-cracks and over-breaking. These benefits are the primary reasons that project managers opt for cutter heads when they know that precision is a high priority. No other tool on the market offers the level of control that a transverse cutter head can provide. If you have decided that a cutter head is the right tool for your next project, here are four tips that will improve efficiency when scaling concrete structures. It is essential to have correct flow and pressure set up on the excavator, backhoe, or skid steer loader before using the cutterhead. The correct setting is crucial to the cutterhead performing at its full potential. If the machine is underpowered it will result in slower rotations-per-minute (RPM) and potentially low stall pressure. If the machine is overpowered it will greatly accelerate motor fatigue and potentially result in failure. When working with concrete and other hard materials it is important to constantly monitor the tips of the cutter bits or picks to make sure they are in good working condition. Depending on how abrasive the material is will determine how long a pick can operate. Working with a worn out pick will inhibit productivity and could create more significant damage to the equipment. Prevent unnecessary down time by paying attention to when picks are wearing out and anticipating when they will need to be replaced. One measure that is implemented in certain concrete scaling projects is a depth guide. Depth guides are custom made and allow precision cutting by limiting the depth the cutting drums can get into the material. Simply pick the maximum depth that you want the cutting drum to reach to, and the depth guide can be made to that specification. Depth guides are only necessary if precision is absolutely critical, but if you have a project where you are worried about cutting too deeply into the material, a depth guide is a great solution to remove that possibility. Excavating equipment is large and needs direct access to the structure. To work as efficiently as possible, organize the working space so that it is large enough to accommodate the excavator and it has room to engage the surface from a direct angle. By engaging the surface from a direct angle, you can ensure the contact is flush with the wall and your operator has optimal precision in the cutter heads movements. If you are looking for areas in your scaling projects that could improve in efficiency, these four steps will help you take positive steps in that direction. Alpine's TC-D (147 hp / 110kW) hydraulic rock and concrete grinder was used to precisely remove aged concrete on a highly sensitive spillway prior to resurfacing on the Black River in upstate NY. The project required precise removal of concrete from atop the spillway, but within a sensitive location. The Alpine cutter head was a logical choice for both low-impact scaling and precision grinding. 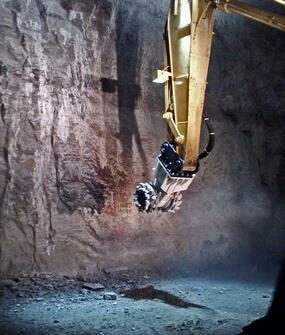 The grinder attachment was installed on a Hyundai R290LC-9 excavator. Alpine hydraulic rock and concrete grinders are the tool of choice for removal of rock or concrete on sensitive areas where precision and minimal impact is a requirement. 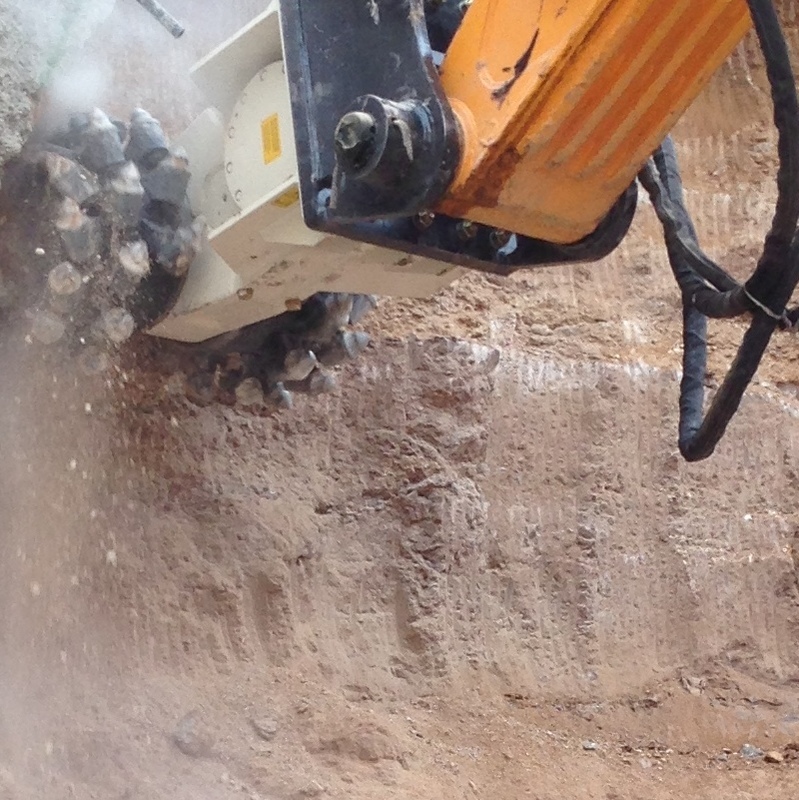 Compared to hydraulic hammers or drill-and-blast Alpine rock and concrete grinders have lower noise, lower vibration, higher precision, minimal disturbance to the adjacent rock or concrete mass, and virtually no overbreak.